Message Systems, known for their email infrastructure software and MTA functionality introduced SparkPost, a new public cloud email service that allows developers to easily add email into their web and mobile applications. With the new SparkPost platform Message Systems is opening the same email capabilities used by the Big guys like Twitter, Groupon, LinkedIn, Match.com and Salesforce to email senders of all sizes. Built on Message Systems’ Momentum platform, which reportedly powers 20 percent of the world’s legitimate email, developers now have API access to the same email sending and delivery optimization platform in a public cloud service.The Message Systems email Infrastructure and MTA is used by many ESPs like ContactLab, Epsilon, Delivra, InfusionSoft, MaroPost, PureSend, Vertical Response and Yesmail. SparkPost is clearly going against competitors like SendGrid, Mailjet, Mandrill and Amazon SES in an attempt to address the middle to high-end of the market that prefers Cloud over on-premise. With the option to grow into the Momentum solution as they grow. Message Systems offers a smooth transition to managed cloud and on-premise editions, using the same APIs as SparkPost. Its scalability also gives customers the ability to easily grow as their volumes dictate. For companies that eventually need their own dedicated email infrastructure. Pricing is pay-per-use with a first tier of 10K sends for free, for testing purposes mostly. With the world’s 12,000+ ISPs setting their own policies and bounce codes for rejecting and regulating email in order to combat spam, companies face significant challenges in ensuring that their emails reach their intended audience. Message Systems claims to be the best in Bounce; having a fix on IPS policies like no other. 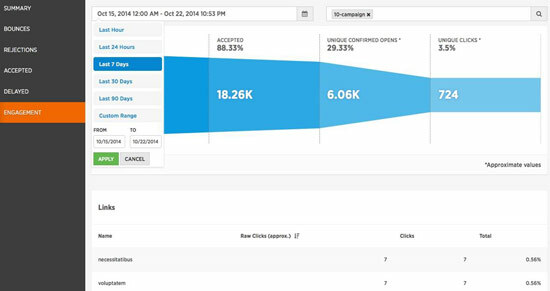 SparkPost delivers analytics tracked in real-time, including latency, bounce reports and full engagement data. As Steve Dille, VP of Marketing at Message Systems told us, it is often a challenge to get individual data back into underlying CRM systems, sometimes having lag or available at aggregate only. One use case is in retargeting campaigns. Without the specifics on individual level and quick access to click data, those are impossible to realize. Below is a screenshot of the pipeline / engagement view reporting that can be accessed via the user interface. SparkPost gives customers access to data with full log file detail via analytics, through a metrics API, in streaming real-time and using webhooks. Industry data shows that developers are rapidly embracing public cloud Infrastructure-as-a-Service and platform-as-a-service offerings. Message System’s new SparkPost offering is designed to serve this market need. Gartner noted the explosive growth and has identified “IaaS as the fastest-growing segment of the cloud market,” They predict that through 2017, spending on IaaS will grow as capabilities increase and as organizations use IaaS for more complex and business-critical workloads.